Old Befana Celebrates 30 years! Happy New Year AND Feast of the Epiphany! Today is the feast day of St. John Neumann, one of the first American saints. He is the patron saint of Catholic Education for his work as the Bishop of Philadelphia and his long-lasting impact after his death. REMINDER: Please mark your calendar with a class date change for February. We will have class on February 19, but we will NOT have class on February 26. Old Befana is happening THIS SUNDAY. It's a great, family-friendly play that's very fitting for the feast of the Epiphany. It's the legend of an old woman who is searching for the Baby King, and the greatest gift anyone could ever receive. The play will take place in the church on Sunday, January 8 at 4pm. It was featured in the Wisconsin State Journal recently. You can find the article below. As always, you'll find our upcoming schedule, however this week we do not have our weekly FORMED feature. 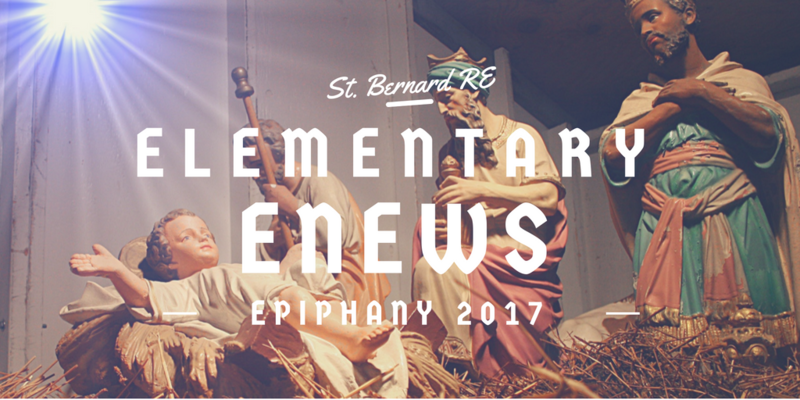 Have a blessed week and happy feast of the Epiphany (on Sunday)! In the long-running Madison show "Old Befana," as in many a Christmastime story, three is a magical number. Think of the Three Wise Men, bearing three gifts. "The Nutcracker's Three Dances." Or Scrooge's visit to three Christmases: Present, Past and Future. For Madison singer-songwriter Ken Lonnquist, three words were all he needed to make a profound change this year to his own Yuletide tale. Lonnquist is the composer of the sweet and uplifting all-ages musical "Old Befana," which is making the rounds of area churches and other gathering places this holiday season. Lonnquist has performed his "Old Befana" for decades — exactly three decades, in fact. The play is based on an ancient and endearing Italian tale that is a tradition in many European households, but less familiar here. It tells the story of a grumpy old woman, Befana. While something of a recluse, she also is known to the people in her village for the wonderful smells wafting from her kitchen and the lovely singing voice they sometimes hear coming from her house. They also know Befana for her broom, which she uses to sweep, sweep, sweep wherever she goes. One night, a bright light pours into Old Befana's bedroom. Unable to sleep, she tries to sweep "every speck of starlight out the door" so she can get back to sleep, Lonnquist recounts. "Suddenly, to compound her aggravation, this caravan of elephants and camels comes along with these brightly robed kings. They say, 'We're following that star. Our books tell us that a special child is going to be born to bring peace.'" Old Befana ignores them and tends to her sweeping. But after a while, she decides to follow the caravan to find the special child. She resolves to bring three gifts: Some of her lovely baked treats, a beautiful song to sing to the child, and her broom, to sweep out its bedroom as the child sleeps. But Old Befana never catches up to the caravan. Instead, legend has it, each year she embarks on a special journey to bring gifts to every child — all children — on Three Kings Day, Jan. 6. "In this story, Old Befana never finds out who this 'special' child is," Lonnquist explains. "Is it a girl, or a boy? Black, or white? Rich, or poor? "She doesn't know, so she visits every child, because every child has potential to make the world a better place, to make the world more peaceful." Because of that message, he said, Old Befana's story is one that people of all religious faiths — or no religious beliefs — can relate to. At St. Dennis Catholic Church, "We've had 'Old Befana' here almost from the very beginning" of its 30-year run, said Judy Hronek, coordinator of parish outreach. "It's about the Epiphany, and that whole idea of the special child — and maybe that special child is you," she said. "The message is just so neat for all ages." Audiences who saw "Old Befana" performed at St. Dennis when they were young now return with their own children, Hronek said. Like most performances of the show held in community centers and places of worship, the Jan. 7 performance at St. Dennis is free. Lonnquist wrote "Old Befana" after Sharon Grady, a graduate student in theater at UW-Madison, asked him to provide music and sound effects as she recounted the Italian Christmas story on a 1986 broadcast on WORT Radio. Lonnquist was so taken by the tale that he agreed to write songs for it and turn it into a 50-minute play for the following holiday season. Lonnquist already had written musicals such as "Alice in Wonderland," "A Christmas Carol" and "Cinderella" for Children's Theater of Madison at the behest of CTM founder Nancy Thurow. Today, Lonnquist is a busy performer around Madison (he performed three back-to-back shows for families last Saturday at the Overture Center's Kids in the Rotunda). He is a three-time winner of Madison Magazine's "Best of Madison" competition in the "best children's musician" category, was named children's performer of the year by the Wisconsin Area Music Industry in 1995, and is a recommended entertainer by the Parents' Choice Foundation. He also has served as a traveling "Minstrel for the Environment." Lonnquist, now 59, grew up the eighth of eight children in a Catholic family and attended parochial schools. He still recalls the life lessons from grade school that play a part in "Old Befana": "If we do what my teacher, Sister Mary Phillip, said in second grade — 'Live by the Golden Rule' — we can make the world a better place," he said. "If I'm nice to you, and you're nice to me, we've already made the world a nicer place for the two of us." "Whatever religion you come from, or none, that is a pretty universal belief or conviction," he said. "So this story has always been, for us, something that families across the spectrum of beliefs have embraced." "Old Befana" is so well known by some local families that they sing along during the show, said Dave Adler, a well-known Madison musician who was in the "Old Befana" cast for several years. This year's cast includes seasoned area performers Molly Breunig, Jeanne Bindley, Joe Thompson, Joanne Schilling, Maeve Breunig and Lonnquist. Schilling, an artist and Lonnquist's partner, designed the show's backdrop and made the costumes. This year is the first that Lonnquist felt moved to change the script he wrote 30 years ago. In the play, the Three Kings have always told Old Befana they are in search of "Bethlehem." Now, they are seeking "Peace on Earth." Although it's just three words, "It's a big deal to me," Lonnquist said. "Because you know when you write something and perform it for 29 years in a row, to make changes is like — whoa, I'm messing with my color palette here. "But for the last couple of years I've thought about this," he said. "I think part of it was the unrest and the violence with ISIS, and all the craziness happening around the world and in our country — so much crazed violence." "Suddenly, the dialogue that we already had, had a whole new potency and richness: 'We're trying to find Peace on Earth. Do you know where it is?' 'Peace on Earth? Never heard of it!' "
"It's just one three- syllable word, but it was very exciting to me as we were thinking about it," Lonnquist said. "Before making that decision (to replace Bethlehem), I talked to some priests and pastors, and told them what I was thinking. They said it wouldn't make any difference to a Christian's embracing of this story." 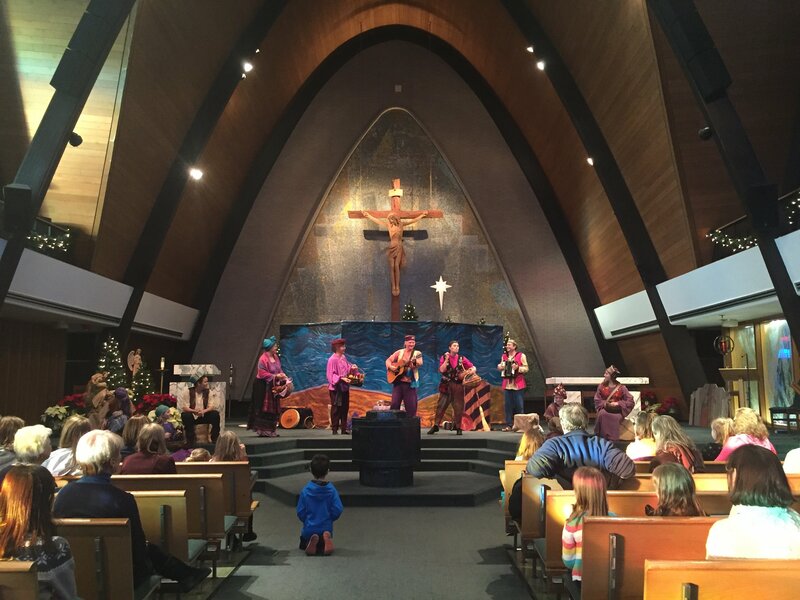 The new wording spoke deeply to Kelly Crocker, minister of congregational life at First Unitarian Society of Madison, where "Old Befana" was performed Sunday. "I love the message and the willingness of Ken to make this change," Crocker said. "Now there's this story of people who are looking for Peace on Earth, which we are all looking for. "It's a beautiful story. It's a magical show, and the music is uplifting and joyful. There's a message of goodwill, that every child is special — and that all of us can make a difference." January 22 - 1st Communion Parent Meeting, 10am. Students have class.